Box Lacrosse, known simply as 'lacrosse' in Canada is played between two teams of six players each (5 runners & a goalie). 'Boxla' is a short hand text based term coined in the 1970s by journalist covering the sport. Boxla is traditionally played on an ice hockey rink once the ice has been removed or covered. The playing area is called the box. In the USA, the game is known as 'Box Lacrosse' and can be played on either roller hockey or indoor soccer rinks. What are the key differences between indoor field lacrosse and Box Lacrosse? Safety - The US Box Lacrosse Association (USBOXLA)'s rulebook contains a myriad of rules that protect its players in this indoor setting. Field lacrosse rules (NFHS - boys) fail to address and protect players who participate in an environment with boards. Box Lacrosse is a stick skills based game and unlike field lacrosse or indoor field lacrosse its rules severely punish open field hits, hits from behind, take out checks, man/ball loose ball techniques and stick swinging defensive techniques. Game play - Indoor field lacrosse is an offseason field lacrosse sport governed by the NFHS (field lacrosse rulebook). 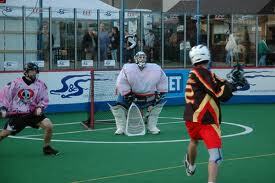 In some areas in the USA large 6x6 field lacrosse goals are used with goaltenders only wearing field lacrosse equipment. Even with shortened numbers the strategies and skills of field lacrosse game play are used. The strategies and skills of field lacrosse are ineffective in a tight Box setting. Box Lacrosse's offensive and defense philosophies and techniques are drastically different than field lacrosse. With nets 20 sq-ft smaller than 6x6's and extremely well padded goalies, players must develop unique refined skills in order to score. With a quick 30 second shot clock and allowing all 5 players to go anywhere in the Box, the game relies heavily on O to D and D to O transition increasing the overall speed and intensity of game play. Box lacrosse's effective defensive techniques limit the effectiveness of field lacrosse's 1-on-1 doges and promotes the creativity of off ball, 2 man, and team play. Equipment - Both player and goaltender equipment are different than field lacrosse. Box players wear additional pads to protect kidney and biceps and also wear long sleeved jerseys to cover any additional equipment. Box goalies are well padded and look similar to ice hockey goalies.